Pop Culture Happy Hour: 'Won't You Be My Neighbor?' Daisy Rosario of WAMU joins the table to talk about the new documentary that looks back at the influence and the unusual nature of a classic children's television show. 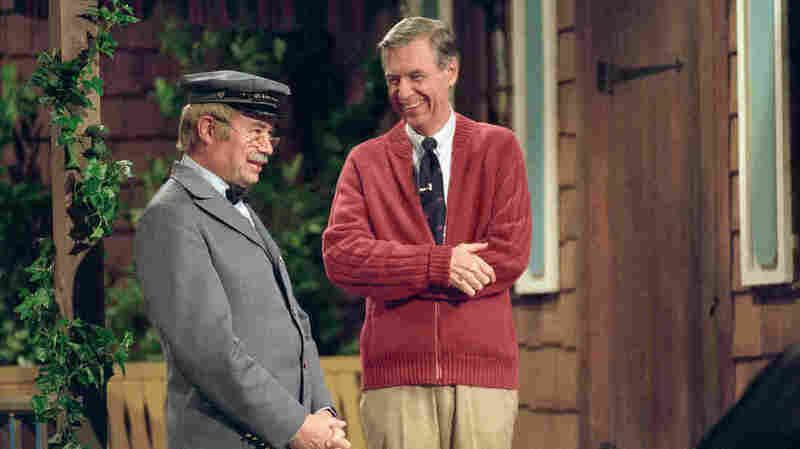 Mr. McFeely (David Newell) and Fred Rogers on set, in the documentary Won't You Be My Neighbor? It's easy to be skeptical of a documentary about Fred Rogers, who hosted Mister Rogers' Neighborhood on public television for decades. Rogers has achieved, as the film acknowledges, an almost saint-like status, and the mission of Won't You Be My Neighbor? is not to uncover some secret dark side of the man — as far as you'll know walking out, there wasn't one. How, then, to make this story interesting? It would not be enough to have endless talking-head interviews with people speaking admiringly of a person already widely admired. Director Morgan Neville, who also made the Oscar-winning 20 Feet From Stardom, does feature those interviews — with Rogers' family (including his boundlessly charming wife Joanne), with collaborators like Yo-Yo Ma and François Scarborough Clemmons (who played the police officer), and with people who worked on the crew. But they are not the only thing he has up his sleeve. What Neville has made is a film about goodness. And his thesis is not that Fred Rogers was good in precisely the way we should all be good. He is not telling you to be a children's television host, impenetrably pleasant, speaking in a soft voice with a puppet on your hand, suspicious of entertainment that rises above a gentle murmur. Neville is not pretending the world would be good or interesting if we were all precisely this. His thesis is that Fred Rogers found the way to be good, to contribute, that worked for him, given his particular flavor of Christianity, his talents, his temperament, and his limitations. For example, Joanne Rogers says at one point that she and her husband both were raised to swallow their anger, and taught that anger was bad. She doesn't speak of that as a positive thing, but he channeled the sometimes peculiar affect it created in him into something good. The intent, it seems, is not to make you nostalgic for Mister Rogers' Neighborhood as much as to make you restless, considering what you have to offer that people will look back on with such admiration. To hear our conversation about the film with Daisy Rosario, subscribe to Pop Culture Happy Hour or listen to the audio on this page.